A screengrab from the video released Monday by The Undercurrent. 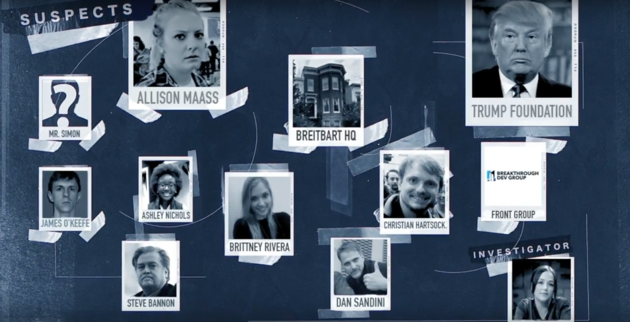 New Orleans Making a list of things I got wrong last year, one has to be my call that we had finally heard the last of James O’Keefe, the video scammer and promoter of “alternative facts” about people and organizations for Brietbart and the alt-right. No matter how many of his agit-props fizzle out like wet firecrackers, his cash supply line seems to keep humming as he tries one ill-conceived publicity stunt after another. Since he’s not going away, the good news may be that he’s being out scammed by folks on our side of the march line. No longer content to be a fake news journalist, O’Keefe, seems to have found bigger bucks as an outright provocateur. Windsor told HuffPost that for now, the group is only releasing an edited version of the video. One of the conservative operatives recorded on it by The Undercurrent was Allison Maass, who previously was caught attempting to infiltrate the Senate campaign of Russ Feingold in Wisconsin, as well as the presidential campaign of Hillary Clinton. Maass was also a lead infiltrator during the voter fraud campaign. The Daily Kos did a brief follow-up of their own and included a tweet from a Cornell Law School professor that this should have been a Class F felony. Who knows? Here’s the takeaway. First, once again it didn’t work, perhaps indicating that we’re all finally getting smarter and not just that he’s getting stupider, because I don’t think that’s possible. Secondly, it would appear that these new groups have formed to finally “do unto others as they have done unto us,” and though it’s a sad statement of the condition of our contemporary political scene, maybe it will end up being one of those “mutual deterrence” things we read about in other nuclear settings. Regardless, for now, go team! This entry was posted in Ideas and Issues and tagged james o'keefe, Trump Administration, Women's March by Wade. Bookmark the permalink.